It is formed as a spherical bead for optimum hydrodynamics and will not pack. It permits maximum water flow and contact with its high density of macroporous binding sites. MatrixCarbon™ has a very low ash content as indicated by its minimal impact on pH. Even when added to distilled water, it does not raise pH above 7.0. While all carbons contain phosphate, regardless of false claims to the contrary, MatrixCarbon™ has the lowest detectable leachable phosphate content of all major carbon brands tested. MatrixCarbon™ outperforms other high grade carbons by at least two-fold when compared for total capacity to remove aquarium organic matter, rate of adsorption, and duration of use. The ingredients from which a carbon is manufactured determine whether it will be macro- or microporous. Carbons made from coconut shell and other organic products form microporous carbons, while carbons made from bituminous coal form macroporous carbons. MatrixCarbon™ is a bituminous coal-based, macroporous carbon. 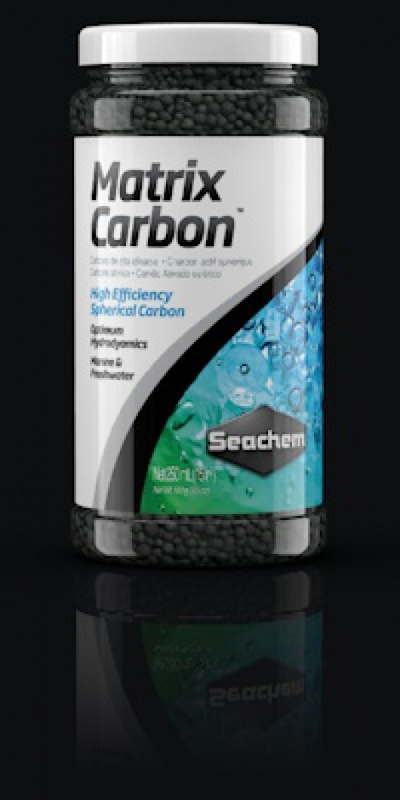 It is the only spherical carbon on the market, allowing for maximum water flow. It is sized to allow full penetration by water, but not small enough to escape filter bags. All carbons contain phosphate. However, that phosphate DOES NOT come from washing the carbon with phosphoric acid. Most carbons are washed with sulfuric acid. The phosphate is contained in the ash from the carbon source. The main purpose of acid-washing is to remove ash. Because of MatrixCarbon's™ hydrodynamic properties, more ash is washed from our carbon than any other. Therefore, it has the lowest leachable phosphate on the market. The 100ml MatrixCarbon comes ready to use in a mesh bag. Suitable for treating up to 160L.